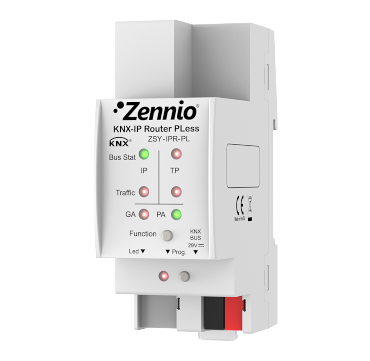 Zennio KNX-IP Router PLess can be used as line coupler or area coupler with a IP based backbone or main line, through KNXnet/IP Routing protocol. It also allows programming or monitoring a device from the IP network (PC, BMS system...) by using KNXnet/IP Tunneling protocol. It does not need external power supply nor PoE.